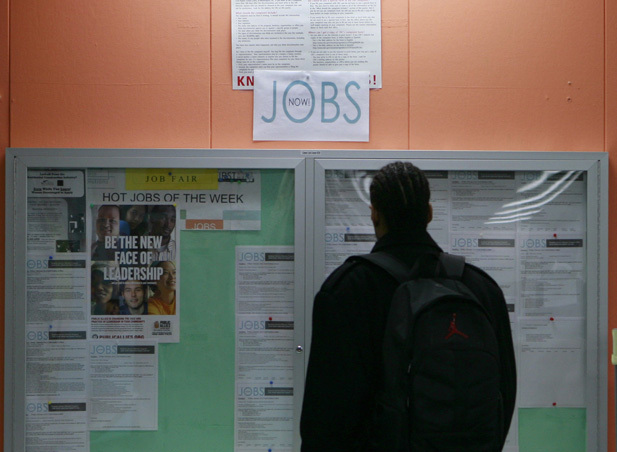 Rediff.com » Business » India's job market is ailing, do we have a remedy? India's job market is ailing, do we have a remedy? Growth in the future must come from increasing physical capital per worker and ensuring workers are better educated and better trained, says Rahul Jacob. It is a sight typical of departure gates at every airport in the country and yet, like so much about India, it evokes wonder. A uniformed Central Industrial Security Force guard tugs lazily at your backpack or handbag to doublecheck that it was put through a security scanner and has been duly stamped. Foreigners are utterly baffled by this practice. If a representative of the Indian worker was needed for a Republic Day parade, the toiling landless farm labourer would stand for those in the rural economy while the CISF guard would be a better example of the proletariat than factory workers. In urban India, one sees Dilbertesque caricatures of people working by mostly not doing anything especially productive - just like the CISF. TeamLease's Manish Sabharwal estimates this useless rubber-stamping costs Rs 1,200 crore annually in wasted manpower, paper and ink. He has written to the Directorate General of Civil Aviation and CISF to no avail. In India, there are more security guards per square kilometre than any place with relatively few crimes affecting the well-off could justify; Mumbai, despite its income disparities, is not Rio de Janeiro, New Delhi, thankfully, is not Nairobi. According to a study by EY, the "manned guard" industry will almost double by 2018 from revenues of Rs 36,500 crore in fiscal 2013. India is a laggard in creating factory jobs; Mr Sabharwal points out that we have fewer as a percentage of the total workforce than the United States, despite its mostly post-industrial economy. But, the country is at least creating more low productivity, low energy and low activity occupations - chauffeurs, lift operators and automatic teller machine attendants, for example - than any large economy in the world, a respite of a sort from the otherwise ugly clouds hovering over job creation. One in every three passenger vehicles sold last year is driven by a chauffeur, adding 800,000 jobs. Add the recruiting spree this year by Ola and Uber and driving someone else around often seems the hot new job in India today. What jobs as chauffeurs and ATM attendants will do in the long-run for India's trade deficit and in creating a middle class remains to be seen. (Many cab drivers have seen salaries double, even quadruple, in the past year.) Aggregate labour productivity grew a handsome annual rate of 6.6 per cent in India between 2001 and 2010, faster than anywhere else but in China, according to the World Bank. Growth in the future, however, must come from increasing physical capital per worker and ensuring workers are better educated and better trained. Yet everywhere one goes in India, there is an epidemic of underemployment while employers complain of a shortage of staff. Asked to use a five-point scale to rate how much of an obstacle (five being very difficult) things like electricity and dealing with corruption were, Indian companies responding to a World Bank survey put tax administration at three and complicated labour regulations at four. As an obstacle to business, though, inadequately educated labour was almost off the chart at five. The NDA government's push last week on skills training is therefore welcome, but it will have to be accompanied by a burst of remedial education in government schools where annual Pratham surveys show that about half of all children in Class 5 struggle with a Class 2 syllabus. Child nutrition, too, will have to improve by levels that will require a superhuman focus by our political class on addressing this problem where we lag sub-Saharan Africa. "Stunting" and "wasting" are the ugly adjectives used to describe the childhoods of so many of India's workers of tomorrow. The inhumane decision by Shivraj Chouhan's government recently to not allow eggs in midday school meals, despite its proven success in places such as predominantly vegetarian Tamil Nadu, is a way of condemning the poor to remain poor. Given this grotesquely unequal backdrop, the most pervasive 21st century service jobs have a weird logic of the "we pretend to pay them and they pretend to work" variety. Drive up to the office tower housing HSBC on Barakhamba Road in New Delhi, and one encounters almost half a dozen guards. Time-pass is their foremost priority. As they are busy talking, the gates take a little longer to open. They come rushing, however, if you turn directly into the empty car park as you pass through the gates instead of going around the entire building to enter from the "correct" side. After all that, another guard waves a security scanner at your bag and lets you in, even if it beeps. Running a 100 meter stretch in a park behind my home this morning, I counted 10 idling chauffeurs and almost as many security guards. There are estimated to be about 6.5 million guards employed in India. For the inadequately skilled, these jobs may be as good as it gets. Whether India can create labour-intensive factory jobs instead that it needs to put millions to work in the next few years looks very unlikely. Buffeted by the stormy global economy, exports declined by 16 per cent last month, a drop now so routine that even the business press buried the news. The domestic consumer market, meanwhile, is feeling the headwinds of a dip in rural fortunes as well as a slowdown in the housing sector, which will hurt construction, a magnet for low-skilled workers, and have a negative wealth effect as Ambit's Saurabh Mukherjea recently outlined. In an equally worrying report, "How many graduates are required to change a lightbulb? ", Kotak Equities' Akhilesh Tilotia and Jaykumar Doshi point out that while universities will push out 1.5 million engineering graduates in 2015, net hiring in the IT sector is now about 250,000 a year. Banking, meanwhile, has created less than 100,000 jobs per year; the public sector reduced the number of clerks by tens of thousands in 2015. Infosys is exploring ever wider swathes for automation. Speaking to Cornell students and faculty last year, Rohan Murty spoke of testing, programming and some kinds of process management as "ripe for industrialisation". A slowdown in hiring and promotions in such coveted higher-paying professions will have an impact on the sale of houses and cars, Kotak says - and on job creation. The World Bank study predicts that if female labour participation rises above its paltry level of 30 per cent in India as it ought to, the challenge to create enough jobs will get harder still. Count on even higher underemployment - and needing many more security guards.